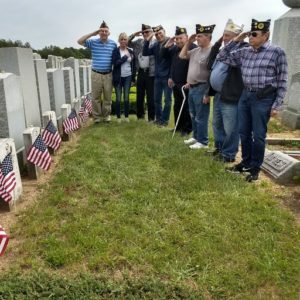 The members of The Jewish War Veterans Lt. Irwin Weiss Post 724 would like to thank you and your staff for providing us with American Flags to be placed on the graves of servicemen who gave their lives in WW2. Today that annual ritual took place at the Wellwood Cemetery. Leonard Honig, our Commander, together with Harvey Albert, Harold Landau and Harvey Drucker honored about 100 of these fallen servicemen. Thank you again for making this possible.